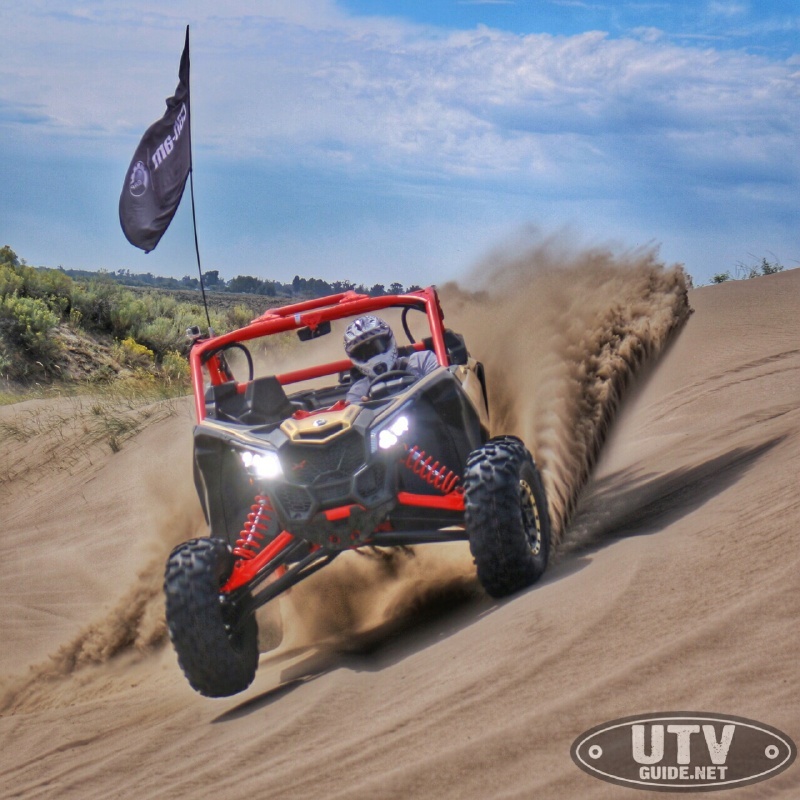 While romping around Idaho’s premier dune playground at this year’s UTV Invasion event, we got the chance to slide behind the wheel of Can-Am’s highest performance UTV to date – the Can-Am Maverick X3 X rs. 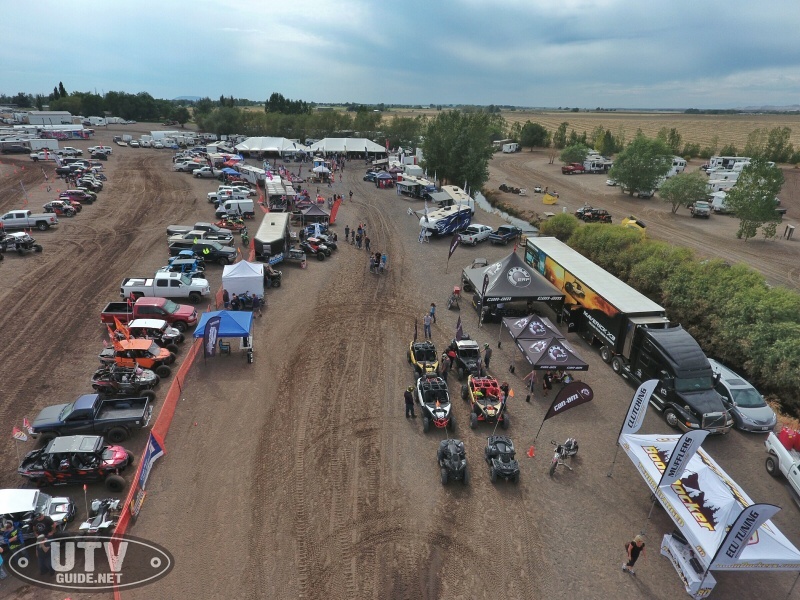 Our extended dune drive allowed us to get a great feel of the new unit’s suspension and engine performance, although there were rumors that the Maverick X3 was slightly detuned for tour duty. 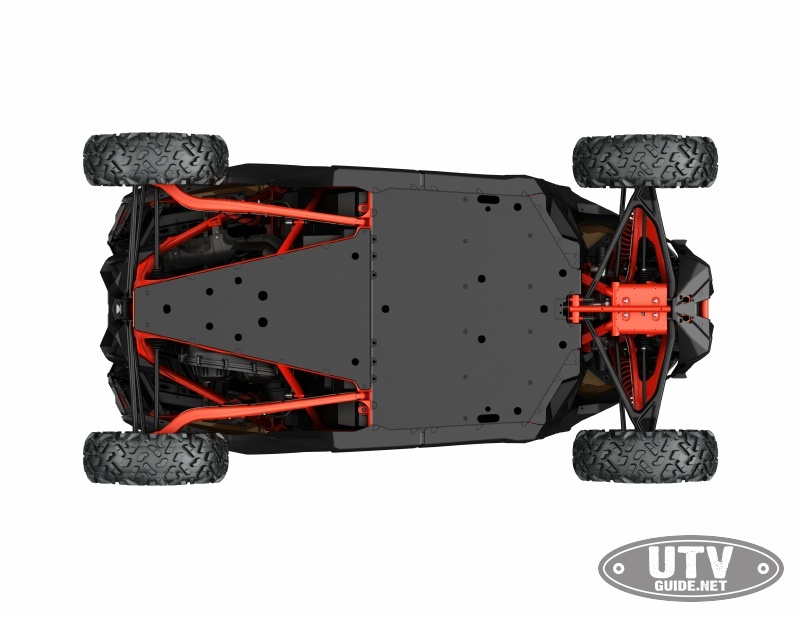 Slipping into the cockpit of the Maverick X3 immediately differentiates it from any UTV on the market. While fairly basic, the cabin of the new Maverick feels special- you sit low, and there is a ton of legroom, even for taller drivers and passengers well above 6 feet tall. Visibility is decent for taller folk, but shorter drivers complained about over-the-hood visibility. 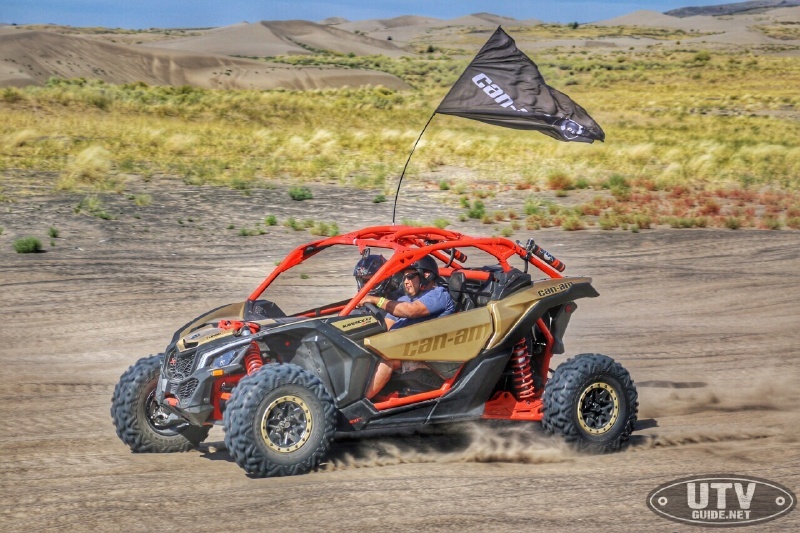 Can-Am has designed a seat that is not only adjustable fore and aft, but can vertically drop lower as well. This is great for people that want an even lower center of gravity, but someone that wants more over-the-hood visibility will have to look at a custom seat bracket to move the seat up. The familiar push button start has become a Can-Am staple over the years returns here, albeit with a rather strange pop-on key that fits over a ball socket on the dash. We do wish the push button start had a proximity sensor for the key, so you could keep it in your pocket like a modern sports car. The seats are tight but comfortable, and the pedal position is great. The reach for the steering wheel is a bit long, but that can be remedied with an aftermarket wheel and hub. 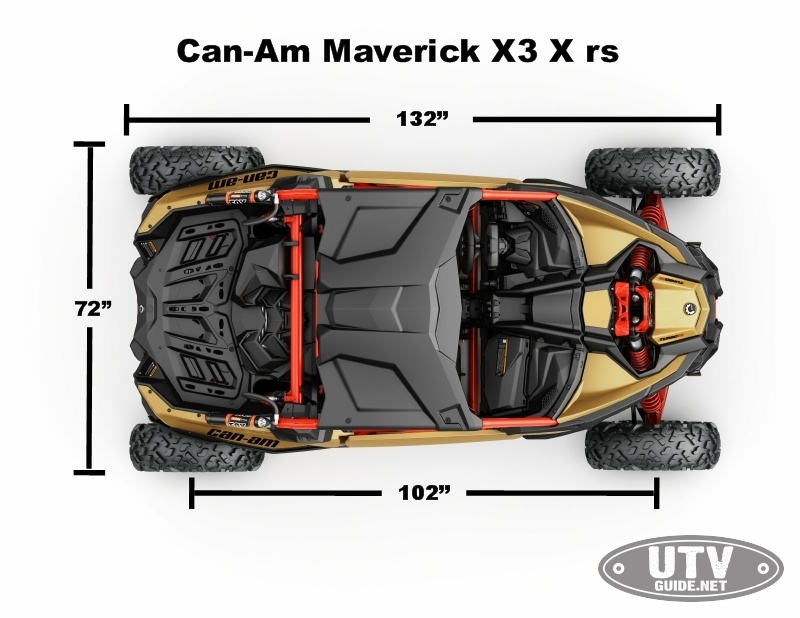 Standard 3 point harnesses don’t chafe your neck, but with the speeds the Maverick X3 is capable of, it would be nice to have four point harnesses. 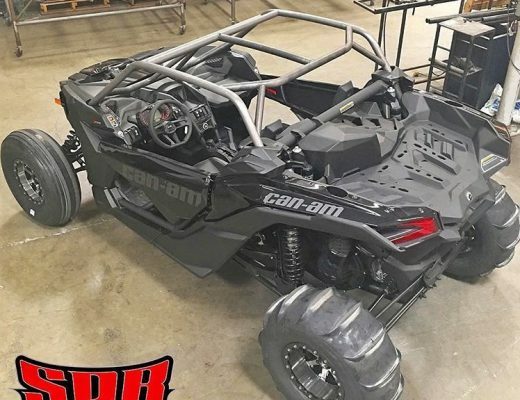 The interior plastics are molded nicely, and there are plenty of storage pockets on the Maverick X3. The glove box is decently sized, with a vertical opening. Passenger leg room is plentiful, allowing you to stretch both legs out and brace against the angled footrests, as the wheel openings do not interfere with passenger compartment space. The rear rack is just that- a rack. 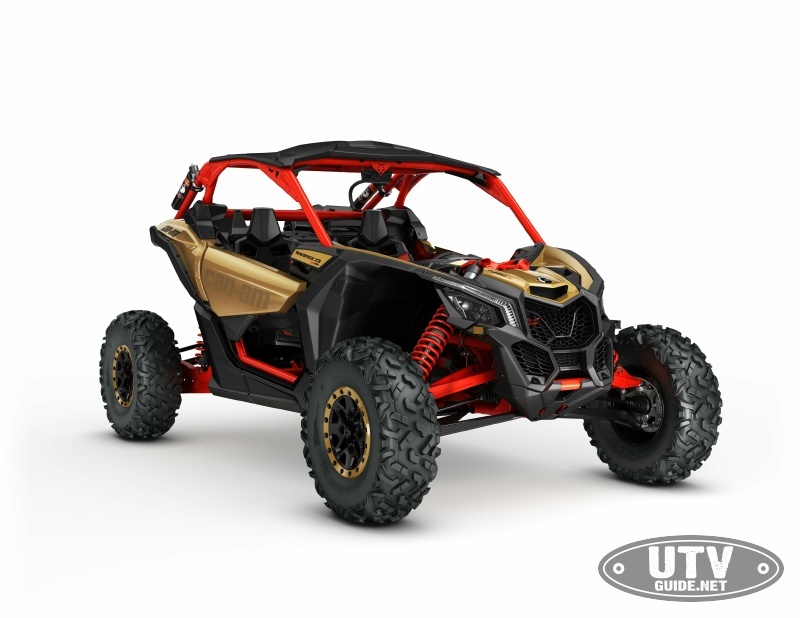 It makes even the standard Maverick look more utilitarian, but Can-Am has developed some clever Linq accessories to increase storage space. The engine stirs to life with a push of the start button, but only if the unit is in park or neutral. Gear selection is straightforward, but the plastic gates on our unit’s shifter were already starting to show visual signs of wear. Nothing that would hinder its performance, but a little unsightly. 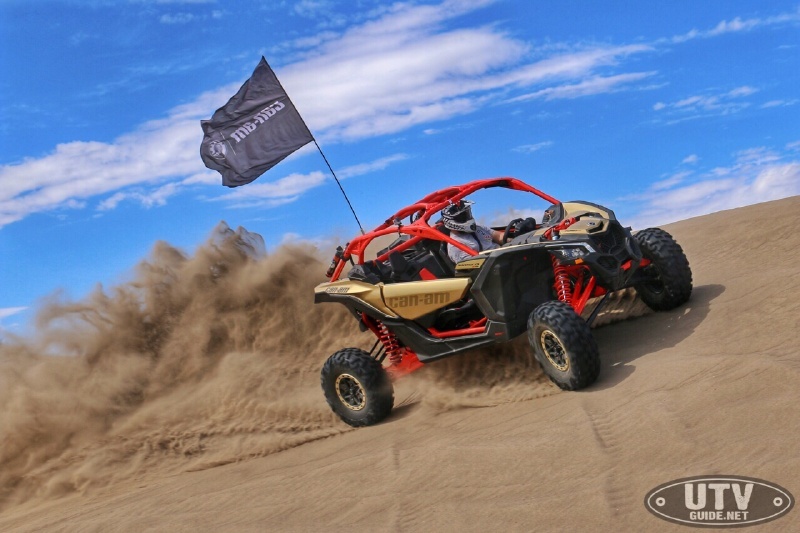 The engine’s exhaust note is mellow but throaty, offering a completely different sound than Yamaha’s screaming three cylinder engine found on the YXZ1000R. Boost and clutching come on smoothly but with authority off the line, with almost no perceptible clutch lag. However, the engine does take a second to spin that turbo up to speed. 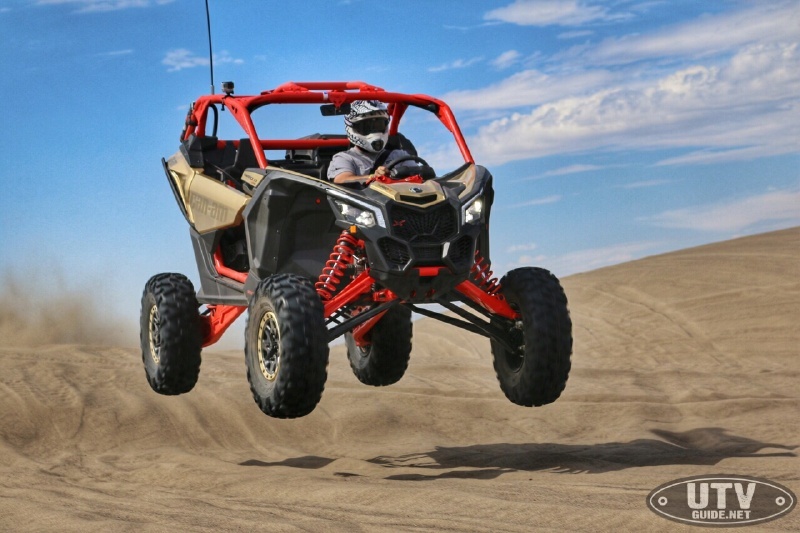 Once the turbo has reached its boost point, however, the Maverick X3 lays down gobs of big power. The torque is silky-smooth, allowing you to drive hard with your right foot while still maintaining traction easily under hard cornering loads. The big Canadian will drift when provoked, but doesn’t step out unless it is asked. We spent all of our time behind the wheel of the X rs model, which is a full 8 inches wider than the other two X3s. Long travel boxed A-arms and massive rear trailing arms provide a whopping 22/24 inches of travel, controlled by almost comically large FOX Podium RC2 3.0 shocks. Damping is extremely well-controlled, and offers a fantastic balance of ride quality and bottoming resistance. Putting your right foot to the ground in the X3 produces a swelling surge of power and a throaty blaaaat from the single exit tailpipe. It’s authoritative, but by no means intimidating. This is a fast car that can be driven by anyone. The steering feel produces zero feedback through the wheel, but is well weighted. Depending on your driving preferences, that could be good or bad- we would have liked a little more communication from the front tires through the wheel. Big drop offs and G-outs simply disappear behind the wheel of the X3, and when set up correctly, the X rs suspension will take more of a beating than any factory UTV ever produced, hands down. The amount of aggression you can exhibit driving this car is alarming- the X3 never seems to come unsettled, even during strange, off-camber jumps and bumps. It absolutely loves whoops, especially deep ones. It makes terrible drivers look like pros-simply mash the throttle and point the wheel where you want to go, and the car does all the work. You find yourself driving into and off of terrain that you would normally check up for, laughing at the amount of drama that the X3’s suspension soaks up. It isn’t without its faults, as there are some cheap materials in the interior and a bit of high speed chatter in tracked-out sand, but its merits far outweigh its weak points. Handling in the X rs isn’t as sharp as the smaller UTVs, or even the narrower X3 models. The wide, long wheelbase car is massive- it can swallow an XP Turbo in its shadow. That taken into consideration, the handling is very neutral with only a slight hint of understeer on hard corner entry. The answer? Throttle. The engine is muted but smooth, and it feels like a high quality piece. 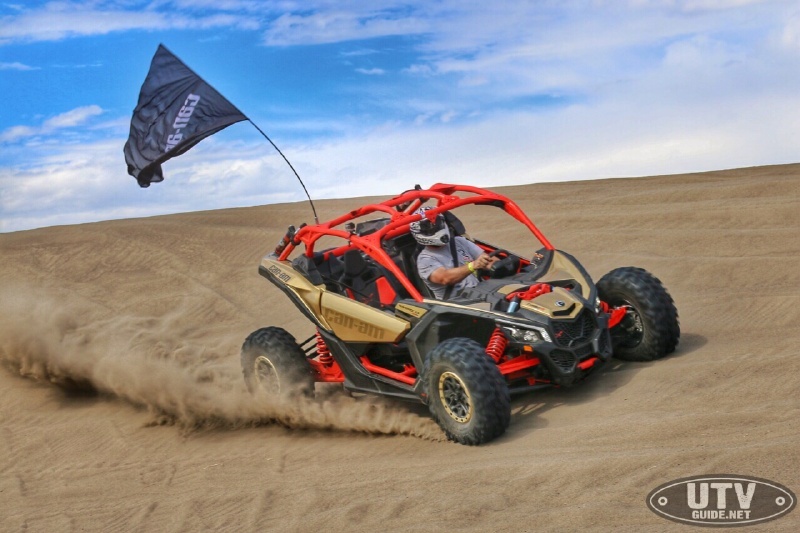 Stabbing the throttle doesn’t produce an immediate reaction like a YXZ, but the torque comes on almost instantaneously, allowing the driver to lighten the front end with a stab of their right foot. We have officially entered a new era of suspension performance with the X3, as the X rs packs as much usable wheel travel as the Commander and original Maverick COMBINED. The envelope has been pushed, and we have a new king of suspension performance. 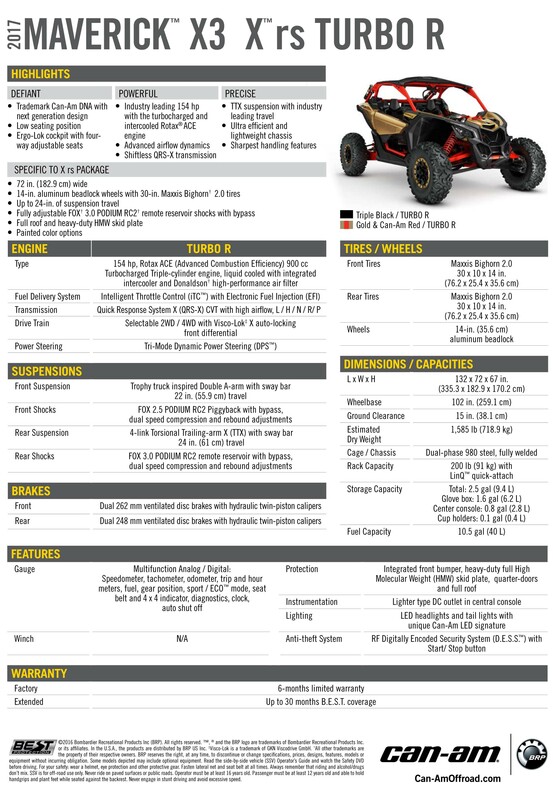 We cannot wait to get more miles on this car and do some more fine tuning, as this is a vehicle you could go race with only slight safety modifications. 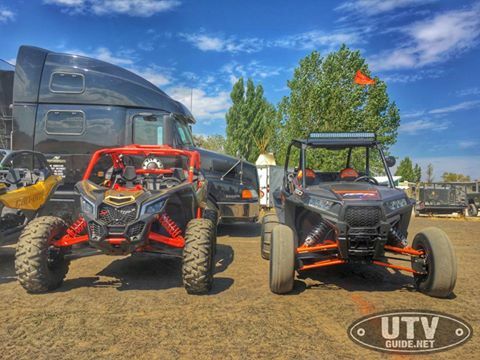 If you’re a duner looking for the baddest UTV to sling sand in, you’ve met your next ride. 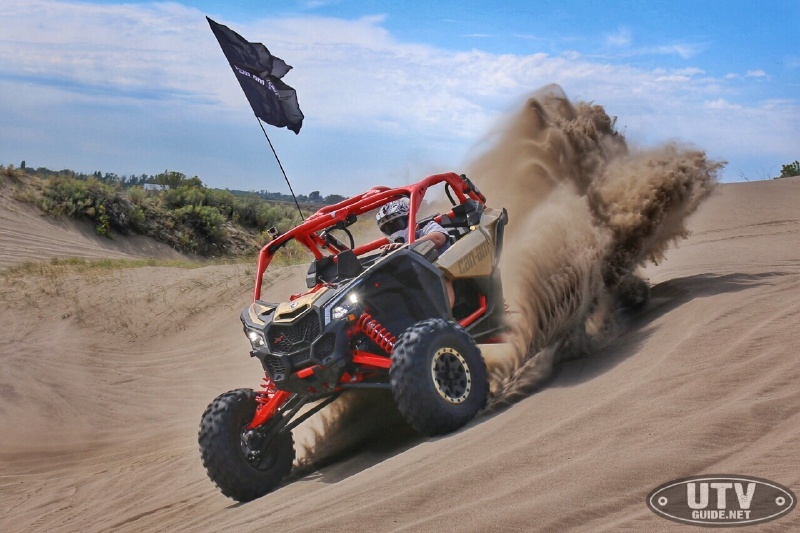 Big thanks to Can-Am for giving us an extended demo opportunity in the dunes. 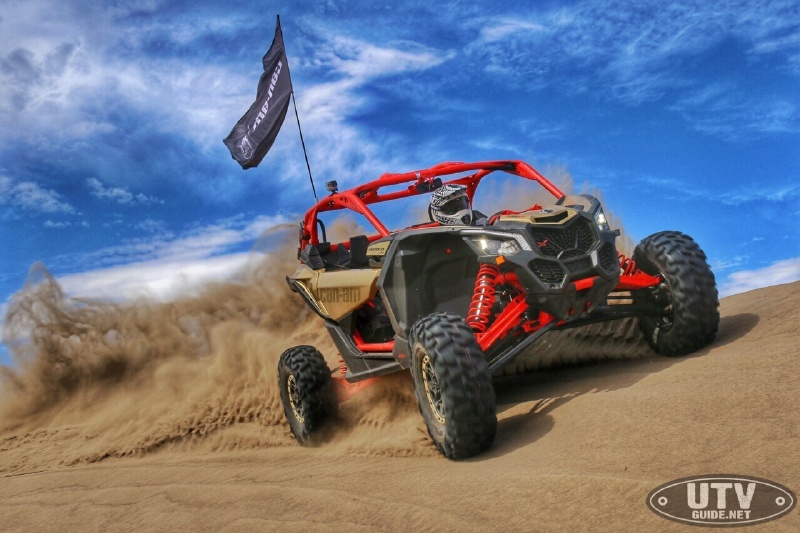 We cannot wait to do more duning in the Maverick X3 with a set of paddle tires! would it climb choke cherry?